The Baltimore Symphony Associates (BSA) will host its 38th annual Decorators’ Show House at the Silo Point luxury condominiums, located at 1200 Steuart Street in Baltimore City. From Sunday, April 27 through Sunday, May 18, visitors will have the opportunity to tour the 4,989 sq. ft., two-story penthouse, featuring sprawling views of the Baltimore skyline. 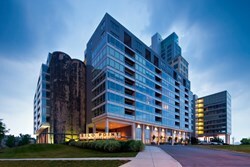 Silo Point luxury condominiums will be the site of the 2014 Baltimore Symphony Associates' Decorators' Show House. The Baltimore Symphony Associates (BSA) will host its 38th annual Decorators’ Show House at the Silo Point luxury condominiums, located at 1200 Steuart Street in Baltimore City. From Sunday, April 27 through Sunday, May 18, visitors will have the opportunity to tour the 4,989 sq. ft., two-story penthouse, featuring sprawling views of the Baltimore skyline. The Decorators’ Show House is an annual fundraiser produced by the Baltimore Symphony Associates, the Baltimore Symphony Orchestra’s (BSO) volunteer organization. Proceeds benefit the BSO’s growing education and community engagement initiatives, including the award-winning OrchKids™ program, Side-by-Side concerts and the Baltimore Symphony Youth Orchestras. See below for complete event information. The BSA’s most popular annual fundraiser will display new trends in fabric and design for home décor. Designers will each redesign one of the 20 spaces in the home, including the foyer, kitchen, living room, dining room and bedrooms of the penthouse. Thousands of people visit the Decorators’ Show House every year to gain inspiration from some of Maryland’s top interior decorators, including past Show House designers Victor Liberatore and Gail Lieberman, Gina Fitzsimmons, Dennese Guadeloupe Rojas, CCBC Interior Design Studios and Interior Design Program Coordinator Laura C. Kimball. New designers this year are James Battaglia, Sheryl McLean, Ricardo Ramos, Joyce Scott, Jeanine Turner and Brad Weesner. The Show House opens on Sunday April 27, from 12 p.m. to 4 p.m. Prior to the grand opening, the BSA will host a Champagne Brunch. Tickets to the brunch are $60 and available through the BSA office. Following the opening, operating hours will be: Tuesdays, Wednesdays, Fridays, Saturdays and Sundays from 10 a.m. to 4 p.m., and Thursdays from 10 a.m. to 8 p.m. Tickets are $25 in advance and are available through the BSO Ticket Office, BSOmusic.org and at all Graul’s Markets, Budeke Paint Stores and Watson’s Garden Centers. Tickets are $30 at the door. Many of the accessories and furnishings used in the designed spaces are available for purchase. Guests may also purchase specialty goods and crafts at the on-site boutique. Gently used items can be found in our Encore shop, and a variety of restaurants and cafes are located in the neighborhood (and on-site) for lunch or dinner. The Baltimore Symphony Associates (BSA) continues its long tradition of volunteers in service to the Baltimore Symphony Orchestra reaching back to 1942 when it began as the Women’s Committee. More than 200 current members use their time, energy and financial support to benefit the education programs of the BSO. The BSA manages the Symphony Store at the Meyerhoff, hosts several fundraising events and serves as ushers at education programs. For more than 80 years, the BSO has maintained a vibrant educational presence throughout the state of Maryland, supporting the local community not only through concerts, recordings and nationally acclaimed radio programs, but also through its commitment to actively giving back with its education, outreach and mentorship programs. The BSO performs approximately 30 education concerts and open rehearsals each year for more than 60,000 area students in pre‐school through 12th grade. Cornerstone initiatives include BSO on the Go, a program that brings BSO musicians into schools for free and interactive music education workshops, and ʺSide by Sideʺ concerts, which allow student musicians to rehearse and perform a full‐length concert alongside BSO musicians. In addition to its comprehensive youth education programs, the BSO serves adult music lovers through audience education programs such as pre‐concert lectures and post‐concert discussions. In 2008, the BSO launched OrchKids—a during-and-after-school music education and life enrichment program for Baltimore’s at-risk youth. OrchKids serves more than 750 students across five Title 1 schools in West and East Baltimore. Tickets are $60 and available for purchase through the BSA office at associates(at)BSOmusic(dot)org or 410-783-8023. Sunday, April 27: 12 p.m. to 4 p.m.
Tuesdays, Wednesdays, Fridays, Saturdays and Sundays: 10 a.m. to 4 p.m.
Thursdays: 10 a.m. to 8 p.m.
Tickets are $25 in advance and are available through the BSO Box office at 410.783.8000, BSOmusic.org and all Graul’s Markets (Ruxton, Mays Chapel and Hereford), Budeke’s Paint Stores and Watson’s Garden Center. Tickets are $30 at the door.